Light-based technologies continue to advance at an impressive speed. They’re being used in new and emerging applications where the ability to control light is critical for success. Ultraviolet (UV) light is used to treat skin disorders, such as jaundice and eczema. In phototherapy applications, it’s important to block dangerous UVC light so that it doesn’t reach the patient. In contrast, UVC light can also be used to damage and kill pathogens. A growing number of hospitals use UV light disinfection devices or robots to combat hospital-acquired infections (HAIs). In other light-based technologies, such as machine vision, filtered light is used to enhance automated manufacturing processes. Illumination with specific wavelengths of light improves imaging contrast, allowing the machine to sort information quickly and accurately. The ability to control light is often the key to many new light-based technologies and products. If you’re seeking to push the limits of what light can achieve, you should consider how glass filters can be used to selectively filter light. Glass is a highly flexible material and can be engineered to either absorb or transmit specific wavelengths of light. 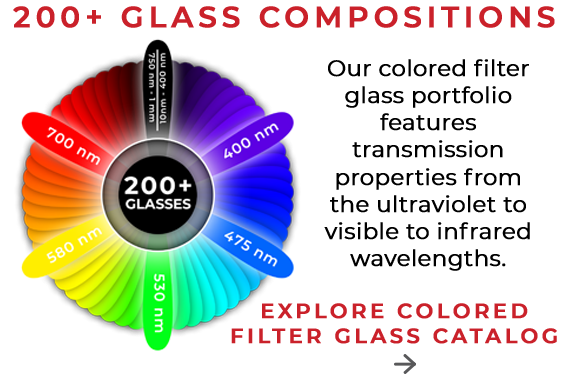 But what should you do if there isn’t a filter glass on the market that meets your new product’s light output requirements? You may feel as if you have to redesign your product–or worse–drop your new product idea completely. Other options do exist. You can work with a glass manufacturer, like Kopp Glass, to engineer a custom glass solution for your product. In this article, we share with you the steps we take to develop a custom glass composition. Most commercial glasses are manufactured using a continuous melting process. This method produces large volumes of glass over extended production runs. These manufacturers may have the ability to engineer a custom glass composition, but their operations are not flexible, and they cannot quickly put unique glass compositions in and out of production. New product development needs to happen fast and isn’t well-aligned with the timelines typical for continuous melting. On the opposite spectrum is batch melting. It is a nimble manufacturing process that can interchange many glass compositions quickly. As a batch glass manufacturer, we can develop a new glass composition and bring it to production in six to 14 weeks. Although, we have brought glasses to production in as little as two weeks. With years of experience and an extensive portfolio of glasses, we can eliminate early experimental steps, which results in faster product development. Before we develop a new composition, we evaluate which of our existing glasses is the closest match for our customer’s application. We then adjust the recipe so that the new glass’ properties match those required by our customer. There are times when we develop glasses from scratch. This is less common, but may be necessary for unique combinations of optical, thermal, and mechanical properties not currently met by any glass in our portfolio. Whether we adjust an existing glass composition in our catalog or start from scratch, the general glass development process is similar. The new glass composition is developed in our laboratory and prepared for small-scale trial melts. What percent transmission do you need? Do you want to block or pass specific wavelengths of light? What chromaticity value or color do you need? What light source are you using? What photometric output do you need? Does your lens run hot in the application? Will temperatures rapidly fluctuate? Will it need to resist thermal shock? Do you need to match the thermal expansion of the glass with another material? Several trial melts are conducted to ensure the glass composition meets the performance requirements. With our compositional adjustments planned, we move to the lab to perform small-scale trial melts. Typically, we conduct several trial melts to map out the best solution for a customer. Following successful experiments, we evaluate and determine that the glass meets all customer requirements before we bring the glass to production. After forming, the part is immediately annealed to remove residual stress. The lens or filter can also undergo additional finishing steps, such as polishing or heat treating, as necessary. Finally, the product is inspected by quality assurance and research and engineering to ensure it meets our customer’s specifications. The last step in the process is to deliver the finished parts to our customer. The timeframe for a custom glass development depends on whether we follow a normal or expedited process. Based on the complexity of the requirements, custom glass development can take anywhere from two to 14 weeks. It is not always easy to find the exact properties that you need in an off-the-shelf (or in-the-catalog) glass composition. Developing a custom glass composition can help you quickly get a solution you need without compromising your design or desired performance. With a newfound ability to control and manipulate light, you’ll be able to develop new and differentiated light-based products. 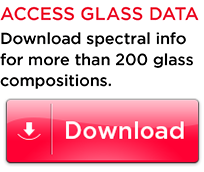 Browse our digital catalog to learn more about our expansive filter glass portfolio. You may find a glass composition that meets your requirements—if not, feel free to contact us about developing a custom glass composition. Justine Galbraith As a Glass Engineer at Kopp Glass, Justine’s passion for glass and light has led her to develop new compositions that push the boundaries of technical glass manufacturing. Justine holds a Ph.D. in Physics from Dalhousie University.